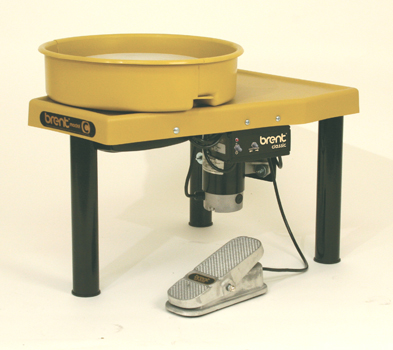 Order the AMACO Brent C Potter's Wheel for your studio or classroom for a sturdy, quiet and dependable product. You can build masterpieces and allow your creativity to flow when you work with this quiet, AMACO Brent C Potter’s wheel. Perfect for classrooms, as instruction can occur without being drowned out by the sound of the working wheels. Your students will flock to the wheel and the way it maintains a constant speed regardless of the amount of clay. Plus, the filtered technology does not cause radio interference if music is your inspiration. Let your creativity give way to peak performance as the four-groove, poly-v drive belt is automatically adjusted to keep a constant tension while you work. Never worry about missing a portion or having to start over as the wheel easily adjusts to your speed. Create smooth, perfectly symmetrical pieces on this delightful and affordable wheel with EZ-feel switches that help you maintain control as you switch the wheel from forward to reverse. The Brent Classic Controller, foot pedal, made of aluminum gives you easily adjustable speeds between zero and 240 revolutions per minute on the ¾ horsepower, 7-amp motor. The four-foot cord allows freedom for positioning the wheels throughout the studio. It is the perfect size for art centers that need multiple stations for students. Easily set up trainings or offer special classes. The steel-construction of the wheel and additional powder coating on the legs prevent them from unnecessary scratching. A quick wipe down and your wheel looks new again. The wheel supports up to 225 pounds for even your largest inspirations. Let your students and yourself learn the art of molding clay on a machine that makes it easier for you. If unsure of techniques, the wheel comes with a free DVD that instructs how to throw onto the wheel. Keep all your supplies within reach on the open area next to the wheel and enjoy the convenience of the free splash pan. You will not want to use another product once you spend time on this wheel. It will be your go-to wheel for years to come.